For women of child-bearing age, folate is essential to help your body make red blood cells and avoid anemia. Folate is the naturally-occurring form of the synthetic vitamin, folic acid, which is added to bread, cereal and pasta products. Also known as vitamin B-9, folate is crucial to the health of a developing child to avoid the most preventable of all birth defects — neural tube birth defects — which affect the brain, spinal cord, heart and mouth. 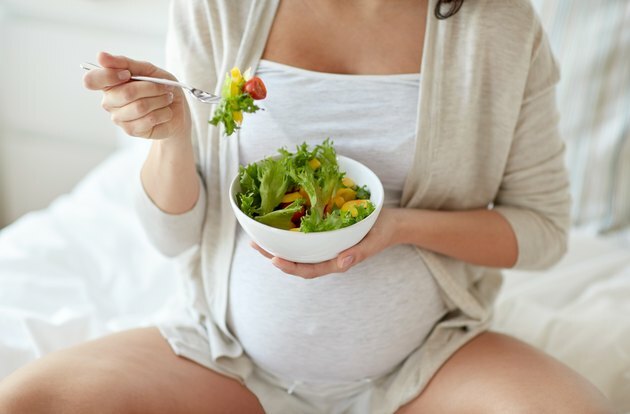 Women need a minimum of 600 micrograms of folate daily during the first trimester according to the National Institutes of Health Office of Dietary Supplements but should start supplementation at least one month before trying to get pregnant. Although folate in vitamin form is the best way to make sure you're getting enough, adding foods rich in the vitamin to your diet will benefit your baby as some health practitioners recommend higher amounts. Pregnant women should also beware of getting too much synthetic folic acid. A 2017 study by the University of Northern Iowa showed that the artificial form of the vitamin — folic acid — can build up in your bloodstreamas an unmetabolized form of the vitamin, contributing to an increased risk of anxiety or even autism. Unmetabolized folic acid begins collecting in the bloodstream at 1 mg. Dangerous dosages of folic acid average six times the daily recommended amount for pregnant women — 3.6 mg. which is sometimes recommended for women who have higher risk of neural tube disorder pregnancies. Eating folate foods or taking naturally-sourced supplements doesn't come with the same risk as high supplementation with the synthetic form. Read more: What is the Function of Folic Acid? If you weren't a fan of eating liver as a child, you may want to give it a second look when you're expecting. Although meat, in general, isn't a prime source of folic acid, beef liver tops the list of foods naturally rich in folate, according to the National Institute of Health's Office of Dietary Supplements. A 3-ounce serving packs 215 micrograms of folic acid - more than a third of the recommended daily intake amount recommended for a pregnant woman. Beef liver is also densely packed with nutrients including vitamin A, chromium, copper, iron and zinc. If you don't enjoy the taste of liver, mix it with ground beef at an 80/20 ratio of ground beef to ground liver. Most grocery store butchers will grind the cut for you at no charge, making it easy to add into a burger patty mix at home. Other organ meats high in folate include chicken livers, beef heart and beef tongue. Add 1/2 cup of cooked spinach to your meal, and you'll reap 131 mcg of folic acid. The folate in the spinach is more bioavailable once the leaf cooks. Raw spinach has just 29 mcg of folic acid per half cup by comparison. Keep a box of frozen <ahref="https: www.livestrong.com="" article="" 425453-ways-cook-frozen-spinach-side-dish="" "=""> </ahref="https:>spinach on hand and cook it up for a quick folate-rich side dish. It loses little of the vitamin in the process, delivering 115 mcg of folate per half-cup serving. Other folate foods that fill the bill of folate-rich side dishes include asparagus and Brussels sprouts. Asparagus delivers 89 mcg in four medium spears, and 1/2 cup of frozen Brussels sprouts contain 78 mcg. Craft a fresh salad using folate-rich veggies. Start with a cup of shredded romaine lettuce to build a base of 64 mcg of folic acid. Add 1/2 cup sliced avocado to add 59 mcg to the count. Other good choices include raw spinach, chopped broccoli and orange sections. Chop up a hard-boiled egg for some protein, and you've up the folate by 22 additional micrograms. Even croutons can add to the total amount of the vitamin you get per day. A half-cup serving of seasoned croutons has 30 mcg. Black-eyed peas won't just bring you good luck if you eat them on New Year's Day, they'll bring 105 mcg of folate per half-cup to your plate to promote your baby's health. Top a salad with a half-cup of canned red kidney beans for a satisfying lunch with 46 mcg of the vitamin. Or toss back a few handfuls of dry roasted peanuts for an afternoon snack: They're a goldmine of folate at 27 mcg per ounce. Fortified grain products are enriched folate foods designed to increase nutritional intake of this vitamin, so unless your doctor specifically has you on a grain-restricted diet, don't worry about trying to live grain-free during pregnancy. Since 1998, the U.S. Food and Drug Administration requires manufacturers to add 140 mcg per 100 grams of grain to products that include cereal, bread, cornmeal, pasta and white flour. The words "fortified" and "enriched" on packaging are a sure way to tell that extra folate lies within. Neural tube defects are the most preventable type of birth defect, so don't slack off on getting the 600 mcg daily recommended for pregnant women. The first trimester is fraught with nausea for some expectant mothers, making it hard to choke down plates full of liver and spinach. Look for a supplement that delivers a full day's supply of folate from natural sources and is the most bioavailable to your baby. Although synthetic folic acid is converted into usable vitamin B-9 by 40 to 60 percent of the population, the other 40 to 60 percent have a gene mutation that can't break it down, making it of little use to your developing fetus. Medical News Today: What is Organ Meat? UpSpring: Does the Best Prenatal Vitamin have Folic Acid or Folate? Will Too Much Vitamin B-6 Cause Birth Defects? How Quickly Can You Increase Your Folic Acid Levels?